With a company slogan of "Drinks on Us!" the two friends Naji Abboud and Elias Tufunkji have started changing the bar scene at weddings in Lebanon and other countries nearby. For most people bartending is pouring beverage in glasses and serving it. Liquid Engineers see it differently; for the innovative team, it is the art of creating, mixing cocktails and providing an unforgettable entertaining experience at weddings and other celebrations. ­­What is Liquid Engineering & what inspired you to start it? Liquid Engineers is the result of a dream that came into reality in 2009. Founded by two friends Naji Abboud and Elias Tufunkji, who had been working in the F&B sector for many years, saw the need for such a service in the Lebanese market, especially at weddings, that were lacking the option of cocktails and bar entertainment. When we first opened for business, the bar catering industry was still in its infancy. Nine years later, we take great pride in our ability to offer a truly diverse range of bar services that constitute our ever-evolving line of bars and catering alternatives. Yet, the most instrumental element that brings it all together is our dedicated and highly-experienced staff, who provide a top-notch service, mixing delicious cocktails and entertaining guests wholeheartedly! 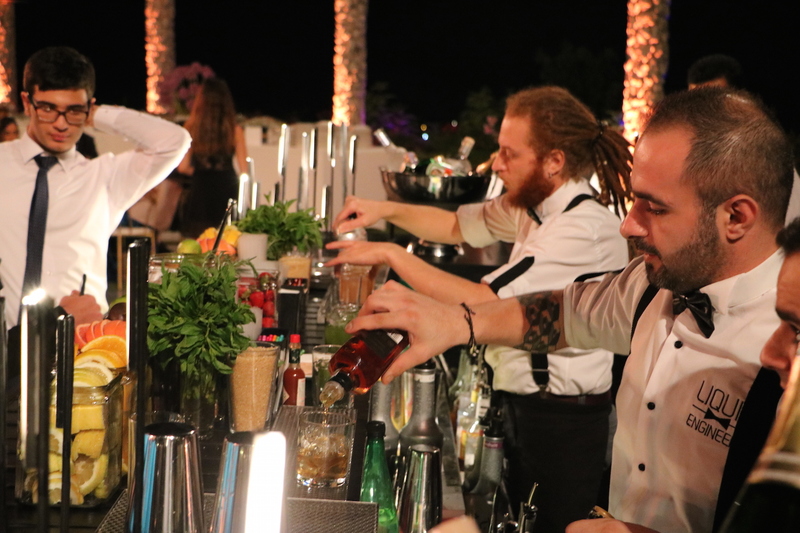 How do you see the bar catering industry (especially for weddings) evolving in Lebanon and the region? The Lebanese wedding industry is getting bigger and bigger and Lebanon is becoming a pioneer in the wedding industry, where Lebanese wedding planners and suppliers are able to provide an A class service and out of the box ideas. Same is being currently reflected in the MENA region, where this industry is booming and paving the way for us to be present in the surrounding countries. By keeping our finger on the pulse, we were able to anticipate market trends and have since been continuously innovating. As a result, we now have a diverse range of alternatives that can easily suit any kind of demand, irrespective of size. We have plenty of customizable bar options sporting various shapes, colors, textures and themes. "by keeping our finger on the pulse, we were able to anticipate market trends and have since been continuously innovating"
What are some of the most popular drinks you serve at weddings? We believe that each wedding has its own identity and its own taste, therefore we always customize a drink menu that suits the theme of the wedding and the couple’s taste. Other than the basic international cocktails such as Sours, Caipis, Margaritas, Daiquiris, Mojitos and Long drinks etc… we focus on four main custom-made cocktails from our menu with our special touch of expertise in making them. In 2018, the most popular signature cocktails are Passionate, Chili Pineapple Margarita, Elderflower Gimlet and our Rosemary Whisky Sour. "we always customize a drink menu that suits the theme of the wedding and the couple’s taste"
Do you cater for dry weddings too? Lebanon is known for its ethnic diversity, which means there are many different types of weddings taking place at the same time and in different areas. Therefore we created a Mocktail menu to accommodate couples who do not wish to serve alcohol but still want a genuine Liquid Engineers experience. Innovation is key to success! The Lebanese market is quite complex and demanding, as evidenced by the state-of-the-art technological services offered at weddings and events. As such, and to maintain relevance, we continuously adopt and adapt novel innovations, ranging from new cocktail trends and bar designs on par with local and international markets. For this specific reason, we always seek new bar designs. Our latest was designed and executed by a leading architecture and design office, and it was the season hit since it wasn’t a deja-vu. We work restlessly to come up with new ideas for each season; our 2019 bar design will be out soon, and who knows, it could be installed at your upcoming wedding, with our engineers serving and entertaining your guests! You can follow Liquid Engineers on Instagram for their latest images and weddings.